Contrary to reports that this will be the last ever season of the Crazy Christmas Cabaret, production company London Toast Theatre has confirmed the team will be returning to the Tivoli Glassalen theatre in 2018 for another full season. Along with the customary standing ovation that tends to greet every show between mid-November and early January, audiences this year chanted ‘One more year’, and it would appear to have had a major impact. 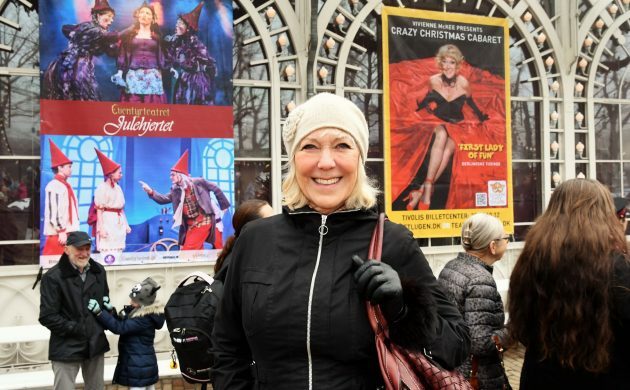 “We have been completely overwhelmed by the reaction,” said the show’s creator Vivienne McKee, who has starred in every single production bar one since its opening year in 1982. Next year’s show will return on November 13 and tickets go on sale in April. In the meantime, the current run, Planet Rump – The Farce Awakens, continues until January 6 before heading to Aarhus for four performances from January 10. A list of the most streamed shows from Danish platforms in 2017 confirms what most of us probably already knew: the young are the most likely to stream. DR TV, TV2 Play and Viaplay’s most popular shows were the fourth season of Norwegian teenage drama web series ‘Skam’, family drama ‘Badehotellet’ and home-grown reality TV series ‘Paradise Hotel’ respectively. However, Denmark’s most popular show ‘Matador’ showed there’s life in the old dog yet, finishing fourth on the DR list. The headline screams “controversial film director”, but for once the subject isn’t Lars von Trier. No, this auteur terrible is Christian Tafdrup, the maker of ‘En frygtelig kvinde’ (‘A Horrible Woman’), a new release that has been sending shivers down the spine of the nation. Charting the relationship of a man with a manipulative, possessive woman, female film-goers from Copenhagen are the most likely to be offended, Tafdrup told DR. Apparently even his own girlfriend thinks he has been a little “naïve”. Bjarke Ingels Group’s new Lego House in Billund has been included on the BBC’s ‘Best Buildings of 2017’ list. The 1,115 sqm visitor centre consists of 25 million bricks and includes a children’s play area and museum. “BIG has made its name with bold, highly expressive buildings that, rarely less than controversial, make perfect sense in the context of a brightly coloured Lego visitor centre that can be clambered over and explored in artful, knowing and playful fashion,” applauded the BBC. Britney Spears will perform at next year’s Smukfest – the ‘Beautiful Festival’ in Skanderborg, central Jutland. Running from August 8-12, this will be the 36-year-old’s first appearance at a Danish festival. MØ and Nephew are also signed on to perform. Unsurprisingly perhaps, tickets for next year’s Smukfest sold out in less than two hours. Since its release two weeks ago, ‘Star Wars: The Last Jedi’ has quickly become the nation’s most watched film of 2017. Worldwide only ‘Beauty and The Beast’ and ‘Wonder Woman’ have earned more, but Star Wars Episode VIII is quickly catching up.